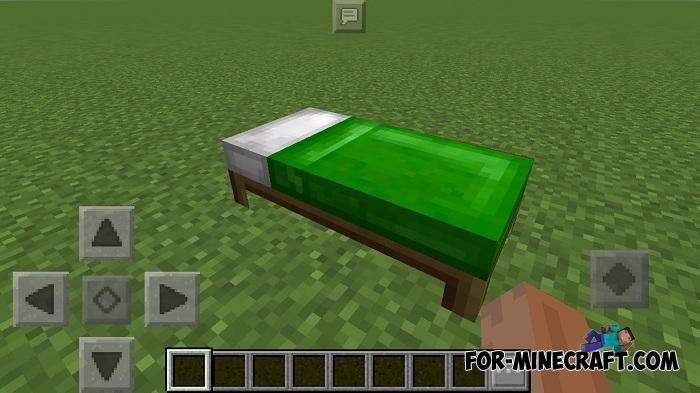 The ability to change the color of the beds is a new feature of Minecraft PE 1.1. Using wool of any color, you can craft a bed of the color you want. Also, developers are planning to add this feature to MCPC 1.12. But if you do not want to wait for the release of the update, then you have a great opportunity to see the multi-colored beds already using the Dyeable Beds addon. The only drawback is that the beds are useless, you just can not sleep on them. How to get these beds? Take a shulker egg and throw it where you want to place the bed. Then take your favorite dye, tap on the bed and the bed will instantly get a new color. The Dyeable Beds addon allows you to more accurately decorate your house by choosing a bed for your taste. Very soon this addon will become useless though. If you want to learn more about the upcoming update of the game then read this article - Minecraft PE 0.18.0 (MCPE 1.1) - new features.